From the award winning Twist & Shout line, this fun learning game features multiplication tables from 0 to 12, with a cool, musical beat. New "Beat the Clock" game challenges children to answer as many questions as they can in 90 seconds, so think fast. Colors may vary. A great toy for any 2nd or 3rd grader. This is not like flashcards at all. My son gets home from school and if it is sitting out he just grabs it and starts playing. Math is not his favorite, but this toy is. He loves to show off his knowledge of the big numbers. (ie. 11x12, 9x12 etc). After I saw how popular this toy was I started thinking of every possible 2nd and 3rd grader I needed to buy Christmas presents for. THE BEST!! I bought this as a last chance thing, because no matter how hard my daughter tried, she could not seem to memorize any multiplication tables past 6. One weekend with this gadget, and she can now not only recite multiplication tables from 1 to 12, but can also multiply equations in her head! Her math scores have doubled, and I am just too happy with this gadget! I have recommended it to other moms going thru the same thing, and after suggesting it to her math teacher, he bought one, and gives it to children to "play" with as a reward! Multiplication fun. I teach third grade. One of my students brought in Twist and Shout Multiplication to help the students review. 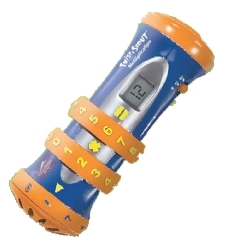 All of my kids love it and enjoy reviewing their math facts with it. It incorporates math review and an exciting game. WOW! What a wonderful toy. Teaching mulitplication facts has never been easier. My third grade students love to practice their facts every day using the Twist and Shout. I have several of these in my classroom. Every night they go home with a different student. I am not sure who plays with them more, the students, the parents, or me. A sure buy for anyone wanting to master multiplication!